According to a new report by National Energy Action (NEA) , a national charity seeking to end fuel poverty, the UK has the sixth worst long-term rate of excess winter mortality out of 30 European countries, with an average of 9,700 deaths per year attributed to cold homes. Fuel poverty can affect the most vulnerable and it often remains an invisible issue due to the stigma surrounding it. Today is Fuel Poverty Awareness Day, a nationwide campaign to tackle exactly this phenomenon. In many cases the problem lies with people not being aware that they can save on their bills by switching to a better deal, which can be exacerbated by the fact that many live in old, inefficient housing that is difficult to heat, further driving up energy bills. Thankfully, there are initiatives out there doing great work trying to tackle the problem. 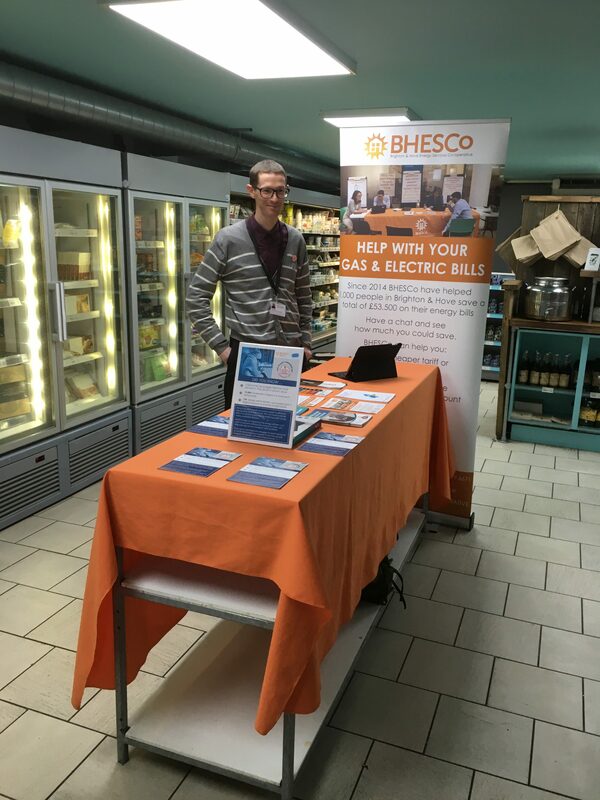 I went out in Brighton today to visit the Brighton and Hove Energy Services Co-op (BHESCo), who set up a stall for Fuel Poverty Awareness Day in HISBE, Brighton’s ethical supermarket. They are raising awareness of the services they offer to people struggling to pay their energy bills, such as showing people how to switch to a better deal or helping them apply for the Warm Home Discount. Local projects like this can make a lot of difference. At the Centre on Innovation and Energy Demand (CIED) our research has looked at energy cafes – community-run energy advice centres – and how they can alleviate fuel poverty. Dr Mari Martiskainen worked with the South East London Community Energy to produce a report based on the research. Find out more about ’The Fuel Bill Drop Shop Project’.